I felt like something sweet for breakfast because a girl can only eat so many eggs and came across this recipe from the civilized caveman. I added a little extra coconut milk to wet the batter a little more. or whatever takes your fancy. 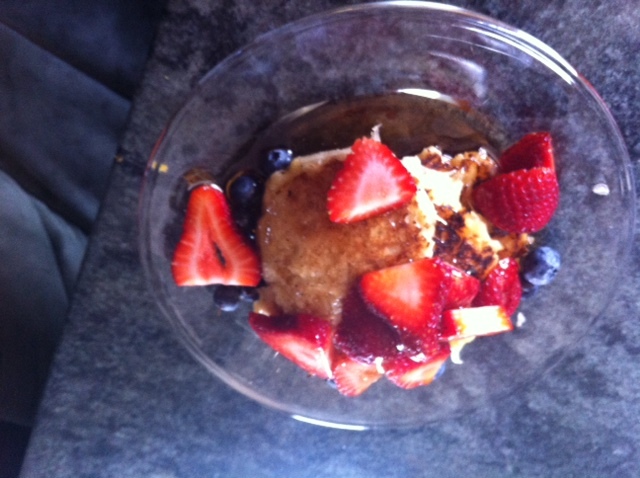 I topped it with sliced strawberries, blueberries and maple syrup. Super quick, easy and soooo yummy. It could also be a dessert if you wanted. Update-I tried this again today and added some almond flour just to tone down the coconut. They were much better. Great now I’m starving! Those look and sound delicious. 🙂 Going to try them next weekend. Hi Molley, thanks for your submission to our “Gluten-Free Party” Linkup! Congratulations, your recipe has been chosen as this week’s Featured recipe! It will be featured on our homepage this week, and has also been sent out to all our followers in our weekly bulletin. Looking forward to more awesome recipes!! Im so very excited! I am so not a food writer but document my paleo journey. I have neglected that side a little but this has inspired me to do some more! Thanks again.